Friday, I wondered how the weekend was going to go because it wasn't starting too hot that day. Well, the weekend got better...thank goodness! Friday night after dinner I went with a friend to see Angels and Demons. I loved the Da Vinci Code so I was really excited to see it! I thought it was good but not great. I still have not read either book, so when the end of the movie came, I was completely caught off guard. I was really surprised and since I'm a major movie fan I was pretty excited about that. Today, I went on a shopping spree since I got paid last night (direct deposit is amazing). Before I go into my awesome shopping spree, I want to discuss payroll. Does anyone who gets paid every two weeks get annoyed by that fact? I work for the government, we get paid every two weeks. Don't get me wrong, I love getting a paycheck but I just wish I could get one every week instead of every two. Now, onto my shopping spree. I shopped for a grand total of 5 hours. 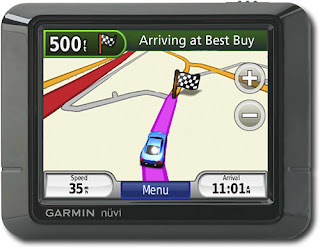 I bought a great new Garmin Nuvi GPS system. I love it! I also bought an adorable summer Roxy dress. I had seen this dress before at the price of 50.00 dollars. I was like, "Hmm, I think that dress is adorable but I don't know if it's worth that much." So I kept passing it by, well today it was on sale for 19.99 and don't think I just walked by this time! It's a cell phone photo so it doesn't do it justice! So far, it's been a decent weekend! If the rain would stop it would be even better. I mean really, I'm starting to feel like I'm living in Seattle! Tomorrow, I'll probably veg out and do nothing because come Monday morning, I've got to be at work sunshine early (technically the sun is still down and it's dark outside lol) at 4:30 am! Fun times! PS: I heard from sweets today, for the first time in days. Apparently, they did his eval. He told me that he got the greatest evaluation he's ever got in his entire military career. He told me that if he decides to stay in that it'll open up more doors for senior officer positions. So congrats to him! 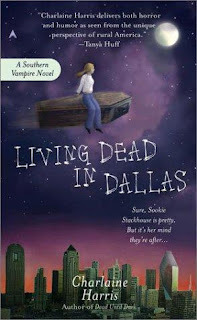 PPS: I also gave in and bought the 2nd Sookie Stackhouse book. Living Dead in Dallas. I'm going to give it a try. In the first book the country twag kind of annoyed me. Maybe it'll get better. We can't wait to see angels and demons, you should read the book it is really good. I love getting paid every two weeks! Every week would be nice, but since I have never had that I don't know what I'm missing! Ha! At my old job (that I was at for about 5 years) we got paid twice a month. The 1st and the 15th. Now that sucked! Ouuuu congrats on the new Garmin!!! You should read both Angels and Demons and Da Vinci Code (Angels and Demons actually comes first)they are so good! Much better than the movies! Fun! I get paid on the 1st and the 15th, when I take my allowance out of hubby's pay...it's nice to control the purse strings. I love Charlene Harris! Although I think her vampire books are the weakest of what she's written. I stopped reading them after the third book... but her grave books, shakesphere books, and aurora teagarden series are just wonderful. Especially Shakesphere. Lily Bard is FEIRCE. About the career Army thing, my hubby was in and HATED it, could not wait for the day he got out. And he has missed it every day since. The Army is a great career.. 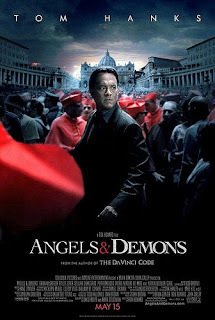 I cannot wait to see Angels and Demons. My husband and I have both read the book. I too am a HUGE movie person! Hope you like the second book a little better than the first!